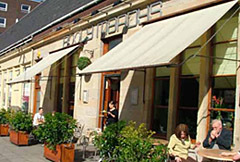 Located in the West End of Glasgow this stylish cocktail bar has an impressive range of spirits and cocktails. Apart from being the subject of a celebrated trademark dispute that resulted in a change of name from Bloody Mary’s to Booly Mardy’s the bar is also known for mixing the meanest martinis ever. With Beefeater, Hendricks and Plymouth there’s plenty of gin choice. The extensive cocktail list covers pretty much everything from the Breakfast Martini with Plymouth to Gin Tea with Hendrick’s to classic Red Snappers with Beefeater. In the summer the outdoor area is one of the nicest in the city.